Looking for two-sided coattail effects: Integrated parties and multilevel elections in the U.S. The following is a guest post by Amuitz Garmendia Madariaga & H. Ege Ozen. Amuitz and Ege are Ph.D. candidates in the Department of Political Science at Binghamton University. This post is based on an article of the same name, which is forthcoming in Electoral Studies. Multilevel structures of government are spreading all around the world but we still know little regarding the relation between tiers of subnational, national and supranational institutions. We have recently published an article in which we delve into this matter by analyzing how and to what extent is the federal structure in the United States incorporated into individual and aggregate level voting behavior. Specifically, we depart from the normative/functional idea of the role of integrated parties in federations (Filippov, et al. 2004, Bednar 2008) to test for its logical electoral expectation: the existence of two-sided coattail effects (Zudenkova 2011) between same party multilevel candidates in concurrent elections. Interestingly, this expectation is also in line with most recent work on the study of coattails in the U.S. (Broockman 2009). To that end, we use – as a motivational starting point – the change that a majority of states has experienced in their gubernatorial election years since 1950’s. Nowadays, only eleven of the fifty gubernatorial races are held on the first Tuesday in November, during Presidential election years in the U.S. The rest have been gradually moved to off-year elections as it can be observed in Figure 1. This institutional change was largely motivated by the idea that governors were supposedly riding the so-called ‘coattails’ of their own party’s presidential candidate (Bibby 1983). According to this logic, races for the governorship would be dominated by, either, heightened partisan divisions or the salience of national issues rather than by issues specific to a given state. Yet, not all states moved their gubernatorial elections to the off-year and this gave us a chance to see whether the concerns about presidential coattails were legit or not, as well as to analyze the possible existence of reverse coattails. Testing this argument was, however, not an easy task. For the intertwined incentives of co-partisans and integrated party strategies to matter at the polls, voters should be able to recognize the benefits of having same party candidates holding executive offices at different territorial levels. Moreover, as it is conventional, we also noticed that there could be a variety of institutional explanations for observing voters behave otherwise (vertical clarity of responsibilities, off-year elections’ incentives, etc). Therefore, we started by testing the assumption that voters should be more likely to vote for the same party candidates – which is casting a straight ticket ballot – in concurrent state and federal level elections, as a first step. Then, for the individual level analysis, we used the Cooperative Congressional Election Study (CCES) on-year waves, as well as the 2010-2012 panel study. Our expectations were that the individual partisan intensity and the approval of the incumbents (at both levels) would increase the probability of a voter choosing a straight ticket. According to the results of our statistical analysis, the stronger the partisan attachment to one of the two main political parties in the U.S., the higher the probability of casting a straight ticket. The results also confirm that Democratic presidential voters who expressed higher levels of pre-election approval for President Bush in 2008 were less likely to cast straight tickets. By contrast, voters who expressed higher levels of approval of Obama in 2012 were more likely to cast a straight ballot. This pattern holds in the case of Republican voters, too. However, the confirmatory aspect of this exercise does not assure the aggregate level observance of ‘two-sided’ coattail effects. According to our theoretical expectations, instead of only observing the classical unidirectional effect from the presidential side, it should be also possible to account for an additional theoretical implication, that is, the so-called ‘reverse’ coattails from same party gubernatorial candidates. In other words, we expect that presidential election outcomes could also be influenced, at the state level, by the presence of particularly strong (or weak) gubernatorial candidates. For this reason, we focused our analysis on those 26 states that since 1960 have had at least one of their gubernatorial elections in a presidential election year. Since we are looking for a bidirectional relationship between presidential and gubernatorial election outcomes, we used a Simultaneous Equation Model (SiEM) for our estimation. 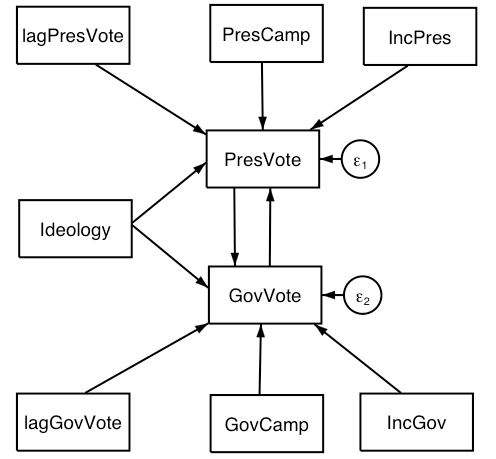 The path diagram shows our non-recursive model with a feedback loop between two endogenous variables: the vote percentage of a presidential candidate at the state level and the vote percentage of the same party state executive candidate. Paradoxically, and contrary to the previously mentioned reasoning behind the process of separating state executive elections from the federal one, we found no significant presidential coattail effects at the state level for the election years within our sample. Even if the effect remains positive across models and after several robustness checks, this null finding stands in sharp contrast to the significant and positive gubernatorial coattails on state level presidential candidates’ vote share. 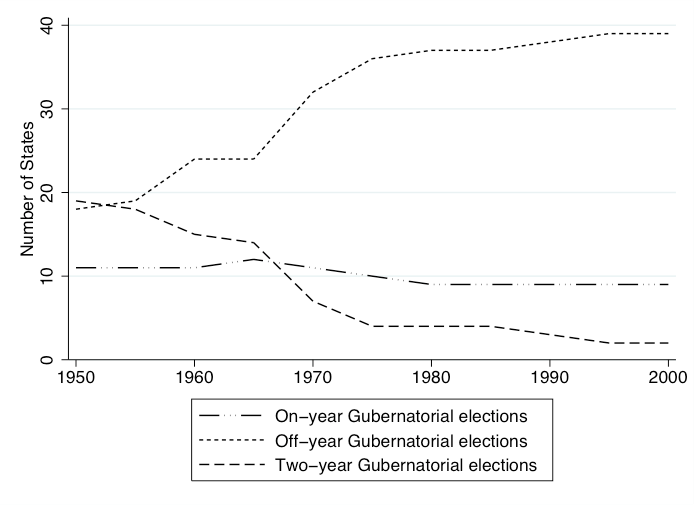 Our research does not show whether in states, which have carried their gubernatorial elections to the off-year, the presidential races continue to influence state executive races. However, our study suggests that the institutional change that 39 states have already gone through might not serve the original motivation. Besides, our study adds to the growing evidence at comparative level demonstrating that local forces also shape national or federal level election outcomes. The lack of significant presidential coattails in our analysis does not only suggest that the political decision to isolate gubernatorial elections was based on an apparently unwarranted electoral concern, it also shows that the existing heterogeneity in gubernatorial term limits can actually be restricting the effect of presidential campaign spillovers. Ansolabehere, Stephen, COOPERATIVE CONGRESSIONAL ELECTION STUDY, 2012: COMMON CONTENT. [Computer File] Release 1: April 15, 2013. Cambridge, MA: Harvard University [producer] http://cces.gov.harvard.edu. Bednar, Jenna. 2008. The Robust Federation. Cambridge: Cambridge: Cambridge University Press. Bibby, J. 1983. “Patterns in Midterm Gubernatorial and State Legislative Elections.” Public Opinion 6: 41-46. Broockman, David E. 2009. “Do Congressional Candidates Have Reverse Coattails? Evidence from a Regression Discontinuity Design.” Political Analysis 17: 418-34. Filippov, M., P.C. Ordeshook, and O. Shvetsova. 2004. Designing Federalism: A Theory of Self-Sustainable Federal Institutions: Cambridge University Press. Zudenkova, G. 2011. “A Political Agency Model of Coattail Voting.” Journal of Public Economics 95: 1652-60. Next → Next post: Is America in Decline?